martial arts training in Judo. At 13 he started studying Tomari-te Karate under Koho Kuba Sensei. 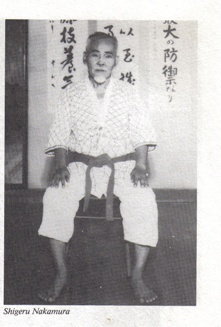 Odo Sensei's principal instructor was Shigeru Nakamura, who founded Okinawan Kempo Karate. He also studied under Seiki Tomo. His kobudo (weapons) instructors were Shinko Matayoshi and Shimpo Matayoshi whose methods were incorporated by Odo Sensei into Okinawan Kempo Karate Kobudo. The majority of kobudo taught in Okinawan Kempo was introduced by Sensei Odo. The Karate taught by Sensei Odo is a blend of Naha-te, Shuri-te and Tomari-te. Odo Sensei passed away in March of 2002. Much of this comes from "Classical Kata of Okinawan Karate" by Pat McCarthy. My first Karate teacher was a direct student of Odo Sensei. I was sent to a Navy class taught on Okinawa in November of 1990. I was able to practice with Odo Sensei and he was so impressed that I had maintained practice of 39 katas for about 7 years, without a teacher, that he promoted me to Nidan. He offered me Sandan and I didn't want to seem overly assertive, thinking I could get back to Okinawa in a few years and get promoted again. I got too involved with Aikido and never got the chance to return to Okinawa. Maehara Sensei taught in Henoko which was just south of the Camp Schwab Marine base. He probably also taught in Nago, Okinawa which was across the island, on the west side just south of the Motobu Peninsula. 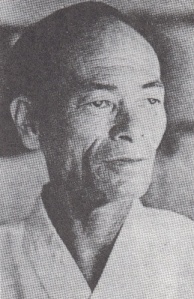 Maehara Sensei was a contemporary of Odo Sensei. Both were students of Shigeru Nakamura Sensei, who was a disciple of multiple students of Bushi Matsumura. In May of 1982, I received orders to Okinawa. Almost immediately the platoon I was assigned to, deployed to Camp Fuji Japan. It wasn't till around October I got to train with Maehara Sensei. I trained almost every night and by February he promoted me to brown belt. I was already advanced because of Karate classes with Sensei Mark Himes at Camp Lejeune, N.C.
time with Maehara Sensei was only about 5 months. Sensei Himes and I were on the same plane for both flights. He was stationed at Camp McTureous in the center of Okinawa and I was at Camp Schwab up north. He had told me to go practice with Maehara Sensei. Shigeru Nakamura taught Okinawan Kempo in Nago city. He began his training as a teenager under Kyoniyoshi no Tamme. His second instructor was Choyo Motobu who as eldest son had been taught a fighting style which has similarities to Aikido. It is not known if that style was shown to Nakamura since it had been passed down through the family. Shigeru's third teacher was Kentsu Yabu who was possibly Okinawa's most proficient kumite (fighting) artist. 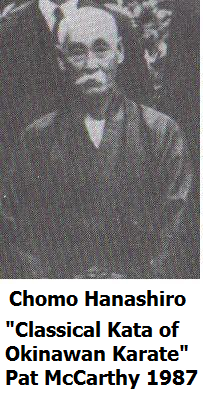 The fourth instructor was Chomo Hanashiro. Motobu, Yabu and Hanashiro were all trained by Bushi Matsumura. Photos and information from "Classical Kata of Okinawan Karate" by Pat McCarthy. Matsumura was born in Shuri, Okinawa, which was the capital of ancient Okinawa. His first teachers were "Tode" Sakugawa and the Chinese military attache Kong Su Kung, also known as Kusanku. He started at age 14 and by 25 he was the best fighter on Okinawa and became the King's chief bodyguard, head of security and military chief for 50 years. He merged the ancient fighting styles of Te and Kempo to create what was known as Shuri-Te which became Shorin-ryu. By combining speed and power into linear strikes the kinetic energy was dramatically increased creating a lethal art for the protection of the King of Okinawa. 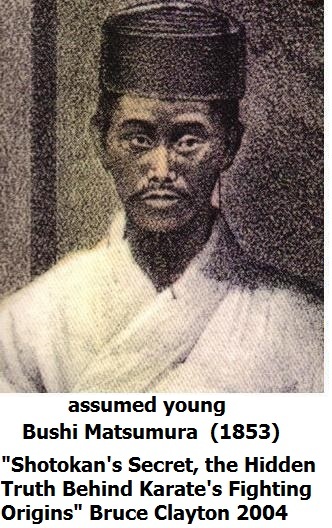 The picture of young Matsumura was cropped from an 1853 picture from the Commodore Perry expedition which opened Japan to foreign trade. The position next to the regeant representing the childhood King and the type of hat indicate a top ranking body guard. 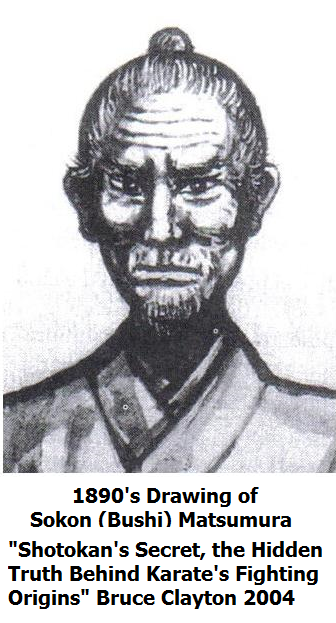 Characteristics of the face are similar to the drawing of Matsumura as an old man. Most of the Karate styles of Okinawa can be traced back to Bushi Matsumura bacause he taught all the Peichin (knights) of Okinawa who formed the security for Okinawa. Karate's Fighting Origins" and Patrick McCarthy's book .